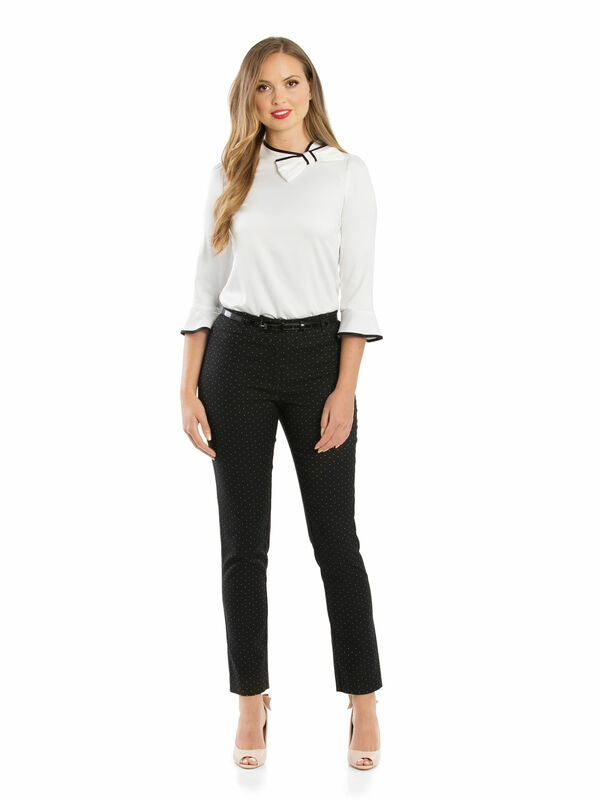 Dionne Pants https://www.review-australia.com/au/dionne-pants-black/RE19PA046.REBLK009.html The perfect slim fit cut which works for both business and play, these Dionne Pants are decorated with a subtle white polka dot print and a patent slim belt. Thanks to the elastane they've got enough stretch for comfort, and they have a concealed zipper on the front for a secure fit. Dionne Pants is rated 5.0 out of 5 by 3. Rated 5 out of 5 by Lilou75 from Classy, stylish but definitely not 'same same'! I bought these pants with the matching jacket and absolutely gorgeous white blouse 2 weeks ago, in preparation for a job interview. The look was completed with some peep toe black heels and matching bag - and an air of sophistication that just comes with these items! I felt stylish and classy, and definitely confident and professional. In addition to my skills and competency for the role - I think this outfit completed the picture perfectly - as I GOT THE JOB!! Rated 5 out of 5 by MegsReviewReview from Perfect Love these pans. Very smart. Comfortable. I'm a size 9 in Review and I tried both 8 and 10, ended up with 10 for comfort. They don't have much stretch so if you're in between I suggest sizing up. Rated 5 out of 5 by Keeth from Spotted! Honestly the best online purchase I have made from Review this year. Perfect fit!